Confession: I am NOT Super Mom! I’m normally a pretty positive person. I try my best not to complain too much, especially in a public forum such as my blog or Facebook. I know that we are extremely blessed to have three beautiful, healthy, adorable little children. I have friends who are unable to have babies, have lost a child, or have children with disabilities and/or serious health issues. Like I said, we are so blessed. So I’ve been contemplating this post for quite some time now, because I know that we are very blessed, but at the same time, not posting it is an unfair representation of my life. I am not, nor is my life – perfect – in fact, far from it. I want to be “real” with my readers and share how some days are just almost too much! But then at the same time I feel guilty even doing so because I know there are families out there that would give anything to only have to worry about my fake problems, not chemo treatments or wheelchairs and such. 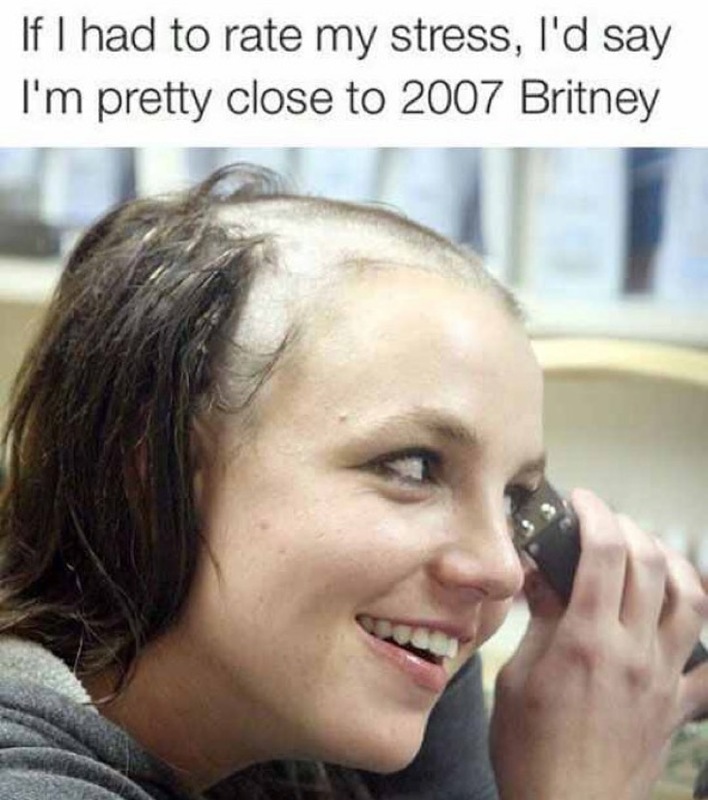 Anyways, after much consideration, and too many days nearing what I keep referring to as my impending “Britney Spears-2007-Shave-Your-Head-Meltdown,” I’ve decided to make this post and share some of the more difficult side of life with three small children, ages 3 and under. Also, in case you missed it, I do have Pro Tips for any of you still considering this who aren’t running for the hills after reading this! On second thought, perhaps I should read them, LOL! I need advice! Anyhow…all that being said…. Holy $hit, y’all. This. Is. Tough. You guys all call me “super mom” and I don’t know why…I feel like I’m always failing at something…and when people say “I don’t know how you do it,” I always say, “I don’t!” I do get help from time to time and I try to practice self care and do nice things for myself (Treat Yo Self). That’s literally the only way I’ve survived this far…That, and as counterintuitive as it sounds, yoga and running keep my energy levels up. Additionally, eating vegan – now primarily raw vegan – keeps my body highly functioning with the most pure and premium fuels. And yes, that in itself is stressful and complicated to plan for (and I do occasionally totally fall off my wagon; I binged on pizza during the flood last Friday! ), but I find myself worse off if I don’t. And I’m slowly getting better at it. So, speaking of survival, like I’ve said numerous times, SURVIVAL is the goal each day. All of us still breathing? Check! And unfortunately, I use this as an excuse probably a lot more often than I should. So the kids had frozen toaster waffles for breakfast again? Yep! Three popsicles each while playing outside? Yep! Skipped real bath and just used baby wipes to clean up? Yep! Forgot to have the “big kids” brush their teeth? Yep! Kept Ty in pajamas all day? Yep! Let the dog lick the floor clean after Rex tossed his dinner off his tray? Yep! Let Landri watch an extra TV show? Yep! Turned up the radio reeeeeeally loud in the car to drown out Landri’s ridiculous tantrums? Yep! Put them to bed at 5pm because I just couldn’t deal anymore? Yep! Oh and people, the list goes on and on and on…This is just the mere tip of the proverbial iceberg. And it doesn’t stop with just the kids. I think it took me like 8 weeks to shave my legs after Ty was born. Whoa. And I’ve definitely forgotten to brush my teeth before too. More than a few times. My eyebrows haven’t seen wax in like a year. Oh and I literally only wear yoga pants. Like everywhere. So my biggest challenges are probably the four items that I will list below. And when you combine them all together, they leave me feeling inadequate, beat down, and like a bad mom. I often seem to find myself losing my patience quickly, and snapping at my kids. And that makes me really sad and mad at myself. In fact, right now my goal is to work on not snapping at them. What a sad goal to have! 1) Tantrums. This is the ultimate challenge of all challenges. Nothing up until this point as a parent has come even remotely close to touching this with a ten foot pole. And even all of the other “challenges” that I will list below that I am currently struggling with do not add up together to be even one one thousandth as stressful as this one particular challenge. Let’s just say that my precious little daughter, whom I love very, very much, morphs into Satan himself. Not just a spawn of Satan, but actual Satan. The Devil. Lucifer. Prince(ss) of Darkness. Beelzebub. She turns red, grows horns, and transforms into a small but mighty little demon child. A demon child who unbuckles her car seat in furious fits of rage while we sail down the highway. A demon child who violently pounds fists and feet into the concrete, drenching herself in sweat as she rolls around on the filthy pavement of Walmart’s parking lot. A demon child who spouts cruel words and throws hits at those who get too close. You get it…and the examples go on forever. The term “Terrible Two’s” is literally the stupidest thing I’ve EVER heard in my entire life. Like, ever. There is no such thing! “Terrible Two’s.” SMH. That’s just such total bull. Instead, it should be the “TOTALLY-BAT-$HIT-CRAZY-PSYCHO-HORRIFIC-AWFUL-INSANE-Three’s” or something like that (and inserting several F bombs in there would also be highly appropriate). What sets these tantrums off, you might ask? Basically anything and everything: the wrong color cup/fork/etc, what clothes SHE picked out that suddenly she vehemently despises, whether her hair has one braid or two, what blanket you tucked her in with – all stupid, totally unpredictable, pointless stuff. So I feel like I live my life walking on eggshells so as to not disrupt the calm…I give her as many (harmless) choices as possible so that she feels in control…but even so, I’m always bracing myself for the next huge explosion…I’m always living in fear it seems. It’s a miserable existence at times. Throw in a wild child toddler (Rex) and a small baby (Ty), and I am NOT kidding when I say I’m close to a Britney Spears 2007 meltdown. And I’ve seen some glimpses of mini-tantrums with Rex (age 19 months), and let me tell you, I’m terrified…I have to not only get through this phase with Landri but survive it twice more. in a row! Is it going to be like three straight years of this crap?!? I’m starting to feel my age and these kids are just accelerating that. And I still don’t think that my lame attempt here in this post to convey what Landri’s tantrums are like, comes even remotely close to explaining how bad it really is! 4) Exhaustion. I live in a constant state of extreme exhaustion – mental and physical. I live in a constant state of physical pain. I have enormous knots in my back, neck and shoulders from carrying, lifting, and wearing my kids. I even have a shoulder injury from this!!! I got an injection which worked for a little bit but now is no longer helping. My doctor tells me that I desperately need PT, and I believe/know this, but it is literally impossible for me to do at this point in my life (the logistics don’t work). My feet and back always hurt as I literally am on my feet all day, hardly ever finding an opportunity to sit and rest, even for just a second. And to top it all off, the baby keeps me from sleeping. It’s been over 7 months since I’ve completely slept through the night….so there’s that too. Just exhausted all around. And for the record, I would totally do #4 if Scott would let me. Despite how hard it is, I really do love these babies and want a hundred of them!!! And seriously. How could it possibly get more stressful and chaotic? LOL! Next Post District Champs: Knights Score Perfect Regular Season, 10-0!